Read the entire, rhapsodic, proclamation here. 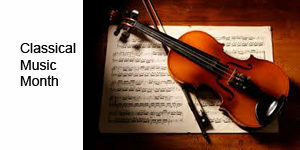 The addictive novel about four young friends navigating the cutthroat world of classical music and their complex relationships with each other, as ambition, passion, and love intertwine over the course of their lives. Also available on audio. A deeply personal, intimate conversation about music and writing between the internationally acclaimed, bestselling author and his close friend, the former conductor of the Boston Symphony Orchestra. John Eliot Gardiner grew up passing one of the only two authentic portraits of Bach every day on the stairs of his parents’ house, where it hung for safety during World War II. He has been studying and performing Bach ever since, and is now regarded as one of the composer’s greatest living interpreters. The fruits of this lifetime’s immersion are distilled in this remarkable book, grounded in the most recent Bach scholarship but moving far beyond it, and explaining in wonderful detail the ideas on which Bach drew, how he worked, how his music is constructed, how it achieves its effects—and what it can tell us about Bach the man. Mozart’s music has enthralled listeners for centuries. In this brilliant biography, acclaimed historian Paul Johnson draws upon his expert knowledge of the era and Mozart’s own private letters to conjure Wolfgang Amadeus Mozart’s life and times in rich detail. Johnson charts Mozart’s life from age three through to his later years—when he penned The Marriage of Figaro and Don Giovanni. Along the way, Johnson challenges some of the popular myths that cloud Mozart’s image: his allegedly tempestuous personal relationships and supposedly bitter rivalry with Salieri, as well as the notion that he was desperately impoverished when he died. Deaf as he was, Beethoven had to be addressed in writing, and he was always accompanied by a notebook in which people could scribble questions and comments. Conversations with Beethoven, in a tour de force of fictional invention, tells the story of the last year of Beethoven’s life almost entirely through such notebook entries: Friends, family, students, doctors, and others attend to the volatile Maestro, whose sometimes unpredictable and often very loud replies we infer. A fully fleshed and often very funny portrait of Beethoven emerges. Mozart’s correspondence is full of details that illuminate the quotidian aspects of his days, reveal the great joys and burdens of his musical genius, and provide us with a lively account of the musical politics in the courts and opera houses of eighteenth-century Europe. Finally, in a letter written by Mozart’s sister-in-law, this splendid epistolary portrait of the great composer is completed with a deeply moving account of his last hours. Who are the ten most important classical composers? Who in the world was Palestrina? Why did Stravinsky’s “Rite of Spring” cause a riot? Which five of each important composer’s works should you buy? What is a concerto and how does it differ from a sonata? Maybe you don’t know the answers to these questions; author Phil Goulding certainly didn’t. When Goulding first tried to learn about classical music, he found himself buried in an avalanche of technical terms and complicated jargon–so he decided to write the book he couldn’t find. The result is a complete classical music education in one volume. Comprehensive, discriminating, and delightfully irreverent. At 5 years old, he composed a minuet. By six, he was performing for royalty. The compelling story of Wolfgang Amadeus Mozart is a timeless tale of musical genius, its rewards, and its pitfalls. Author and musician Marcus Weeks takes us around Mozart’s world—from the Royal courts of 18th century Europe to the opera houses and balls where Mozart enjoyed triumph and fame. We meet the kings and queens of the age, learn of the young Mozart’s favorite games, see the clothes he wore, and the new musical instruments of the time. As a central figure at the birth of modernism, Debussy’s influence on French culture was profound. Yet at the same time his own life was complicated and often troubled by struggles over money, women, and ill-health. Walsh’s engagingly original approach is to enrich a lively account of this life with brilliant analyses of Debussy’s music: from his first daring breaks with the rules as a Conservatoire student to his mature achievements as the greatest French composer of his time. The Washington Post called Stephen Walsh’s Stravinsky “one of the best books ever written about a composer.” Debussy is a worthy successor. Anthony Tommasini offers his own personal guide to the canon–and what greatness really means in classical music. What does it mean to be canonical now? Who gets to say? And do we have enough perspective on the 20th century to even begin assessing it? To make his case, Tommasini draws on elements of biography, the anxiety of influence, the composer’s relationships with colleagues, and shifting attitudes toward a composer’s work over time. Because he has spent his life contemplating these titans, Tommasini shares impressions from performances he has heard or given or moments when his own biography proves revealing. Also available on audio.